 Use the policy tester — This is a simplified version of the Smoothwall System’s policy tester. For more information, see Using the Policy Tester . 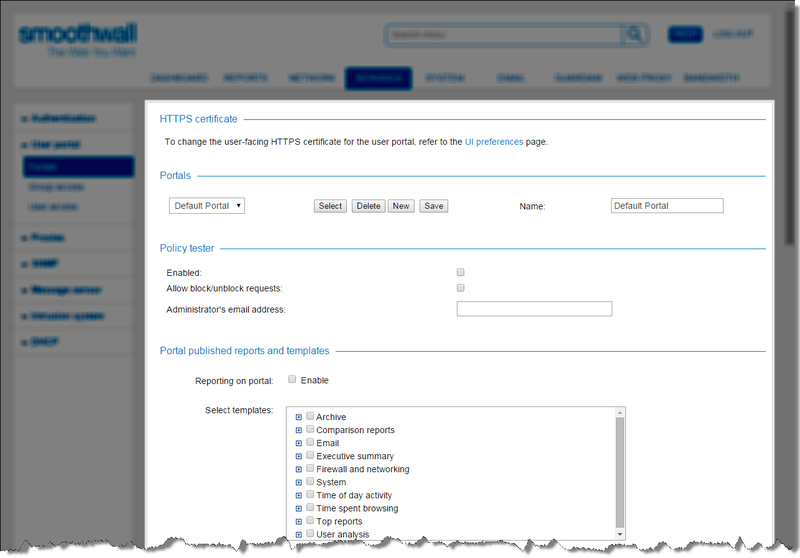 The policy tester enables portal users to test if a URL is accessible to a user at a specific location and time. It also enables them to request that content reported by the tool as blocked be unblocked by the Smoothwall System’s system administrator. • Allow block/unblock requests — Select this to allow portal users to send an unblock request to the Smoothwall System’s system administrator. Note: For Multi-Tenant licensed systems, it is not possible to allow tenant administrators to run the policy test tool for other tenants. There are two methods available to make reports available to a user portal; you can either add a number of reports at the same time, or add them individually. • If the Smoothwall System is licenced for Multi-Tenant you will have an additional parameter: Restrict reportable tenant data to. From the drop-down menu, select the tenant data sets applicable to this portal. For information about tenants, see About Multi-Tenant Managed Services . You can also use this option to select those tenants whose administrators can run those reports on behalf of other tenants. Note: Bandwidth is a licensed add-on module of the Smoothwall System, and may not be available through your administration interface. For more information about using the Bandwidth module, refer to your Smoothwall representative. • Allow control of bandwidth classs — Select to enable or disable Bandwidth class management from this user portal. Note: For Multi-Tenant licensed systems, it is not possible to allow tenant administrators to control Bandwidth classes for other tenants. For more information about the Bandwidth module of the Smoothwall System, see About Bandwidth Shaping. • Enabled — Select to enable or disable web access management from this user portal. • Allow control of groups — Select to enable or disable blocking of web access for groups from this user portal. • Allow control of locations — Select to enable or disable blocking of web access for locations from this user portal. Note: For Multi-Tenant licensed systems, it is not possible to allow tenant administrators to block web access for other tenants. For more information about configuring groups, see Managing Groups of Users . Portal users can add or remove domains and search terms from web filter categories. • Manage filter lists on portal — Select to enable or disable filter lists management from this user portal. Note: For Multi-Tenant licensed systems, it is not possible to allow tenant administrators to edit categories for other tenants. You can configure the portals to make an SSL VPN client archive available for download on the portal. The Smoothwall System enables you to display a customized welcome message when a user visits a portal. where Smoothwall System_IPAddress is the IP address assigned to the Smoothwall System.